February 5, 2019 JACKSONVILLE, FL – Team JAS, the Solutions Company announced today the establishment of a new Team JAS Mechanical Engineering Scholarship program at the University of North Florida. "Team JAS and the University of North Florida’s College of Computing, Engineering & Construction have built a very strong relationship over the past few years” said Paul Theofan, President of Team JAS. "We currently employee five recent UNF graduate engineers and one intern, with plans to add more this year. Developing the Team JAS Mechanical Engineering Scholarship program with UNF’s College of Computing, Engineering & Construction was a great next step to not only assist worthy UNF engineering students with their expenses but also to promote the strong bond between our business and our great local University”. "Team JAS has been a long-time supporter of the University of North Florida, having attended numerous recruitment fairs which led to the direct hiring of qualified engineers and interns for their business” said Marc B. Kaiser, Director of Development at UNF’s College of Computing, Engineering & Construction. "It started with the first intern hired just a few years back and has turned into a great industry / academia success story in our local area”. Team JAS is a customer driven solutions company that has supported Turboprop Operators Worldwide for well over 30 years. 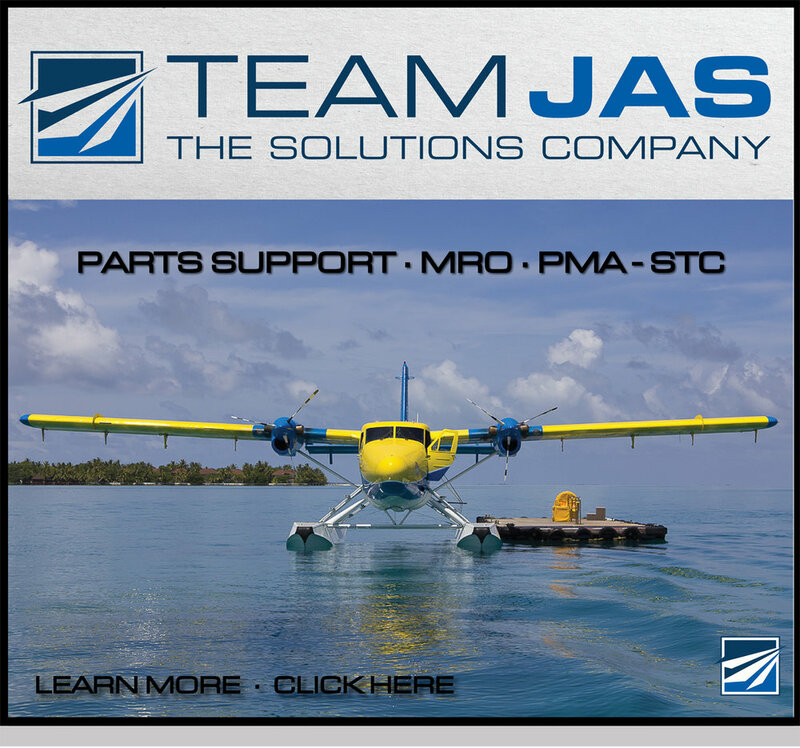 With a focus on the Twin Otter and Dash-8 fleets, as well as various other Turboprop platforms, Team JAS has long been a trusted resource to operators looking for timely support and value. Headquartered in Jacksonville, FL, the 33,000 square foot facility includes sales and logistical support, an engineering and manufacturing division and an FAA & EASA Certified MRO facility. Flew Roatan - Dallas-Addison, TX - Gillette, WY 08/09-Feb-2019 returning from Antarctica. Flew Coventry - Wick - Keflavík - Narsarsuaq 05-Feb-2019, however diverted to Nuuk instead. It continued Nuuk - Goose Bay, NL 07-Feb-2019, and Goose Bay, NL - Bangor, ME - Corning, NY 09-Feb-2019. The flight is being operated by Canada’s World Wide Ferry. Test flown from Perris, CA 06-Feb-2019 following completion of major repairs. The aircraft had sustained considerable damage in an accident at Perris on 24-May-2017.